A-4,5 Sector 16 Logix Park Noida - 201301, U.P. Logix Group, established more than a decade ago has become a renowned name in the real estate market. The group has been associated with a number of well-known FDI partners including ICICI Prudential, Taib Capital, Alpha Real Capital UK and Citi Property Investors in different projects. Logix Group has been associated with the development of a number of residential, commercial, IT, SEZs and hospitality projects in the NCR. Since its establishment in 1997, Logix Group has been providing luxury real estate projects to its clientele, ensuring quality and uncompromising excellence in construction. Covering a long list of both national and international clients, Logix Group has served more than 4000 satisfied clients. The group has been credited with the development of some of the best commercial projects in the country including the Logix Cyber Park. Logix Group’s vision involves identifying and maximizing growth opportunities so as to create value for its clientele, business partners and the society. The group has a mission to enhance client satisfaction through excellent customer service, commitment to improve the life of its clientele and improve its products and services. The Logix Cyber Park has been certified by the Leadership in Energy and Environmental Design (LEED) Silver rating by the US Green Building Council. 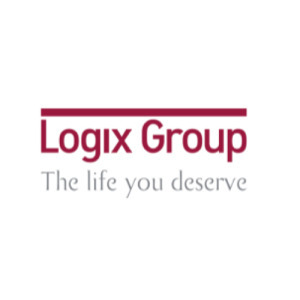 Over the years, Logix Group has become synonymous with quality, growth and dynamism.